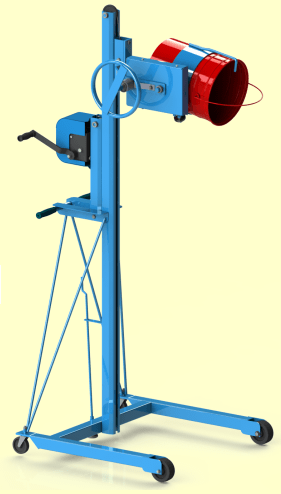 The Morse Model 83 Pail Handler is designed to lift and pour a 5-gallon (19 liter) metal can or plastic pail weighing up to 150 Lb. (68 kg). Pour up to 5 feet (1.5 m) high. Compact enough to move through standard doorways, pail handling is made easier in tight spaces with this maneuverable pail handler. - Lift and pour 5-gallon pail (19 liter). - Lift, tilt and dispense with ease. - Hand crank to raise pail. - Hand wheel to control pour angle. - Pour up to 5 feet high (1.5 m). - Capacity: 150 Lb. (68 kg). Use the hand crank to lift your 5-gallon pail and the hand wheel to turn it. 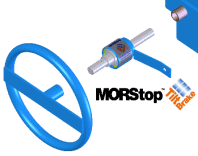 The MORStop Tilt-Brake prevents your pail from turning out of control. Your pail only moves when you turn the hand wheel. Set the floor lock to prevent the unit from rolling while you dispense. This safety-oriented pail handling design encloses moving parts to eliminate pinch points. The MORStop Tilt-Brake between the hand wheel and the gearing, is standard on the model 83 5-gallon (19 liter) pail handler. This device prevents an unbalanced pail from turning on its own. The pail automatically remains where you stop turning, until you turn the handle again. Model 83 is shown here with optional Counterweight Kit (part # 3930-P) in place and the base reversed to allow pail handling and pouring beyond the front wheels. The top of a 5-gallon (19 liter) pail held horizontally reaches 19" (48 cm) beyond the front wheels with this configuration. NOTE: The capacity is reduced to 75 Lb. (34 kg) with the optional counterweight kit installed. 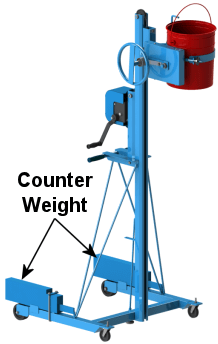 5-Gallon (19 liter) Pail Handler - Ergonomics Brings Customer to Morse for Pail Handling.